'The Snowy Baker Story' is an action-packed romp full of astounding true tales and 16 pages of fabulous photographs and images. 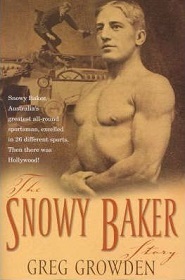 Reginald 'Snowy' Baker - a non-drinker and health and fitness fanatic - represented Australia in three sports at the 1908 Olympic Games, played in two rugby union tests, represented his country as a horseman and travelled the world as a champion swimmer, diver and boxer. His life story is entwined with the stories of all the major sports figures of the first half of the 20th Century: Frank Beaurepaire, Les Darcy, Duke Kahanamoku, H.H. Dally Messenger and Freddy Lane. Snowy next embraced the life of an entrepreneur, potion maker, publisher and boxing promoter, mixing with many of the major figures in Australian social history before he and his trusty 'Boomerang the wonder horse' took up a career in film. Snowy starred, produced and undertook all of his own stunts in some of the first feature-length Australian films including 'The Man From Kangaroo'. Then it was off to Hollywood where his escapades included filmmaking with Charlie Chaplin, teaching Rudolf Valentino to kiss and to fence, instructing Elizabeth Taylor to ride for National Velvet, playing polo with Roy Rogers, providing advice and a front for Spencer Tracy as he began his affair with Katharine Hepburn and protecting a philandering Douglas Fairbanks Snr from his wife. A full life indeed for a working class boy from Surry Hills.